On May 25, 1812, President Madison writes to Thomas Jefferson enclosing copies of the letters that he has received from Jonathan Russell in London and Joel Barlow in Paris . These letters were brought on the Hornet, which had arrived after a 21 day journey across the Atlantic. Madison writes "Our calculations differ widely. In the mean time, the business is become more than ever puzzling." 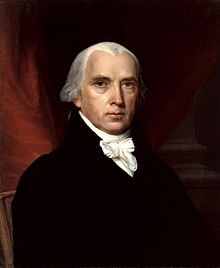 Madison's letter lays out the question of war as a logic problem with two options: war with Great Britain or war with Great Britain and France. Missing is the third option of peace which appears to have been ruled out. There is something unsatisfactory in Madison's analysis even if the letter is only meant to be a brief report to Jefferson. The analysis is threadbare. Considerations of the likelihood of success or readiness for war are absent. The consequences of war are examined primarily through a limited political calculus of whether it will be useful for party politics. Madison's letter does suggest strongly that war with Great Britain is his only option since he writes that war with both Great Britain and France "presents a thousand difficulties." Madison's letter is reproduced below. The inclosed letters came under cover to me, by the Hornet. France has done nothing towards adjusting our differences with her. It is understood that the B. & M. Decrees are not in force agst. the U. S. and no contravention of them can be established agst her. On the contrary positive cases rebut the allegation. Still the manner of the F. Govt. betrays the design of leaving G.B. a pretext for enforcing her O. in C. And in all other respects, the grounds of our complaints remain the same. The utmost address has been played off on Mr. Barlow’s wishes & hopes; in much that at the Departure of the Hornet which had been so long detained for a final answer without its being obtained, he looked to the return of the Wasp which had just arrived, without despair of making her the Bearer of some satisfactory arrangement. Our calculations differ widely. In the mean time, the business is become more than ever puzzling. To go to war with Engd and not with France arms the federalists with new matter, and divides the Republicans some of whom with the Quids make a display of impartiality. To go to war agst both, presents a thousand difficulties, above all, that of shutting all the ports of the Continent of Europe agst our Cruisers who can do little without the use of them. It is pretty certain also, that it would not gain over the Federalists, who wd. turn all those difficulties agst the Administration. The only consideration of weight in favor of this triangular war as it is called, is that it might hasten thro’ a peace with G. B. or F. a termination, for a while at least, of the obstinate questions now depending with both. But even this advantage is not certain. For a prolongation of such a war might be viewed by both Belligts. as desirable, with as little reason for the opinion, as has prevailed in the past conduct of both.